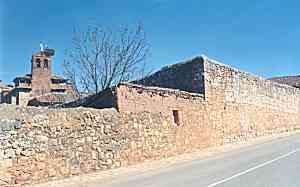 Don Alvaro de Luna, Supreme Commander of the Military Forces, was an important figure in the history of Ayllon. The Marquis of Lozoya, in his book 'The History of Spain' (the second edition, page 349 and onwards), tells us that the King had started to reign at the age of forteen, and that he reigned only in appearance since "although he was gifted with excellent qualities as a man, he lacked all those necessary for a king". He hadn't been blessed with the precocious qualities of his father and in order to sustain the false belief amongst his subjects of his rule, a cabinet of fifteen members was set up in Segovia. All these precautions were in vain however, against the power Don Alvaro had to influence the King. One could say, without being mistaken, that the will of Don Alvaro was the the King's real authority, keeping him in Castilla and champion of the King and Queen's dispute in Europe. 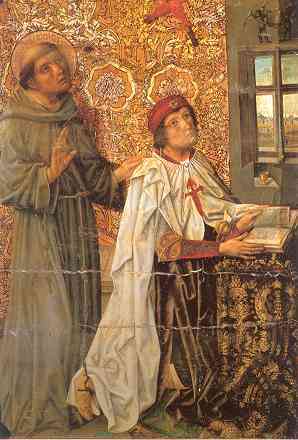 He was a skilled politician and fought tirelessly against the aspirations of the nobility, especially the Aragonese nobles. After the historic events in Montalbán, the prestige and power of Don Alvaro grew and grew. In 1423 Don Alvaro de Luna, who exercised a vigourous policy against Prince Enrique (Prince Richard), was promoted to 'Condestable de Castilla' (Supreme Commander of the Military Forces of Castilla). Vergara, in his book 'The History of Segovia' (The Diego de Colmenares Institute), tells us that "Great discords were united in Castilla; noblemen against Don Alvaro, and impetuous Don Alvaro against them, with the King, devoid of of courage and authority". He then continues: "On the 9th of September,1438 a confederation was formed in the town of Curiel against Don Alvaro de Luna. It was formed by Don Pedro Zúñiga, the Count of Plasencia, Don Pedro Fernández de Velasco, the Count of Haro, and his son, Don Pedro Velasco, which gave rise to the proverb "Cuando los tres Pedros van a una, mal para don Álvaro de Luna" (When the three Peters unite against one, it's bad news for Don Alvaro de Luna). The persistance of the nobles, who were so full of envy they failed to see the political greatness of Don Alvaro, and who were backed up by avaricious Prince Enrique and the King of Navarra, was such that the royal court agreed to banish him, leaving the King without his right-hand man, who for so many years had been his only support. It was then that the most flourishing period in the history of Ayllon begins, and the weak King, condemned to remain in the hands of the self-seeking nobility, suffered his worst punishment. 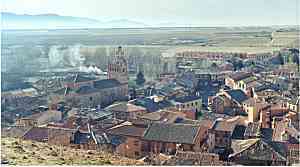 According to the chronicles that Don Alvaro took from Simancas, along with a fabulous entourage of horsemen, prelates and gentlemen, to the castle of the hospitable town of Ayllon, the banishment was, as Quintana suggests, perhaps the happiest time of his life, since he enjoyed all sorts of pleasures and they say he lived more like a prince than an outlaw. His banishment, far from lessening his fortune, was more like a promotion, and even more so when one considered what was happening meanwhile in the Court of Castilla. Things were going too far (murders, theft, fights, sacrilege). So much so that people, from grand Lords to those at the bottom of the social scale, cried out to the King to get Don Alvaro de Luna back at the court again. They say he refused three times before accepting with resignation, presenting himself before the King in Turégano for that was where the court was in that Segovian town. The King greeted him with honours. Don Alvaro bowed and the King got off his chair where he was seated in his drawing room and went out to him welcoming him with open arms. One could say that from that moment on, peace and order reigned in Castilla. King Don Juan II was a widow and Don Alvaro de Luna arranged for him to marry Isabel of Portugal in 1447. It was to be the main reason for his downfall. After a lot of scheming, Don Alvaro de Luna, Grand Master of the Order of Santiago, 'Condestable de Castilla' and 'sovereign' for so many years, was beheaded in the Main Square of Valladolid on the 2nd of June, 1453. Although it might not be in history books, it is worth telling the tale of Don Alvaro de Luna as local tradition has it. 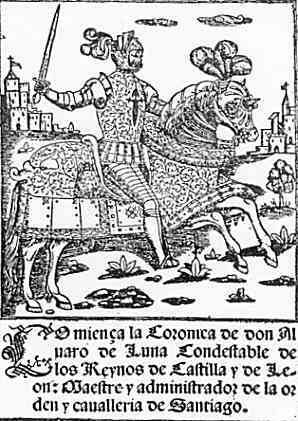 They say that Don Alvaro de Luna was in Ayllon with a great personal army when he was condemned without knowing it, and that when the royal forces came to arrest him and take him to Valladolid, he escaped down a drain beneath the city walls and that after walking many miles he returned and gave himself up, confident that the King wouldn't be able to cause him any harm thanks to all the services he had rendered to him. That is why, according to legend, that just as the Carrvajal brothers summoned Fernando IV, Don Alvaro de Luna summoned Don Juan II. The King was in Segovia where he had gone at the end of May to avoid being in Valladolid, where his order was to be carried out and it is said that the very morning when Don Alvaro de Luna was executed, there was a terrible storm in the old city of the Aquaduct which lasted many hours, and lightning struck the Alcázar or royal palace. According to legend, in the light of a flash of lightning, he saw the tragic scene of the town square in Valladolid and heard the beheaded unfortunate Don Alvaro de Luna commanding him to report to God within a year to tell him how he had repaid the services rendered to him. 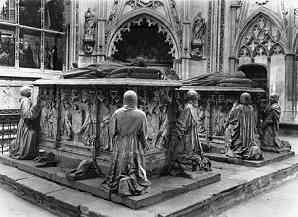 The King, overcome with fear, fainted and was found by his servants on the ground. From then on he became ill with sadness, regretful and repentant of his justice and haunted by the sad memory of the terrible fate of the man who had served him faithfully for forty years. He moved to Ávila and then to Medina del Campo in search of relief, but feeling even worse, he went to Valladolid , where his wife, Doña Isabel, was. He died a year after Don Alvaro de Luna was executed. In 1658 the Castilla Council found Don Alvaro de Luna innocent of the many crimes, excesses, offences, wrong doings, tyranny and bribery for which he had been charged.